I hope you all enjoyed a week full of fancy beers, but now it's back to business on the BWB Podcast. What does that mean? I think it's time we finally took that trip down the road to Boone's Farm! You all know it was only a matter of time before we finally discussed this beverage at bumwinebob.com and today is that day. After last week was taken over by the world of craft beer, this week we will be discussing Boone's Farm and how it relates to the bum wine world. Many times you have heard me classify Boone's Farm is a "bum wine light" or as the "bum wine training wheels". 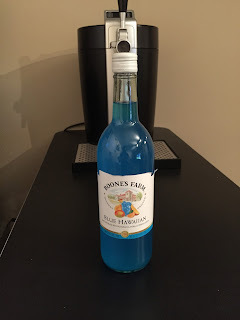 While Boone's is no longer classified as a "wine" and is now a "malt beverage" we are still naming Boone's Farm Blue Hawaiian as the BWB Wine Of The Week. It was announced last weekend that we now have a DJ in place for the BWB WrestleMania 32 Bash in Atlantic City, NJ. Within the next few months we will be finalizing the details of the event so you can plan accordingly and join us LIVE and in person for the extravaganza. Don't forget that with the NFL preseason underway there is still time for you to join in the BWB NFL Pick Em for the 2015 season! It will be more fun than a ride on the night train express, so be sure to throw your name in the hat! All that and MORE was covered on this weeks episode! Check it out! Cheers! Listen to "Bum Wine Bob Goes To Boone's Farm" on Spreaker.